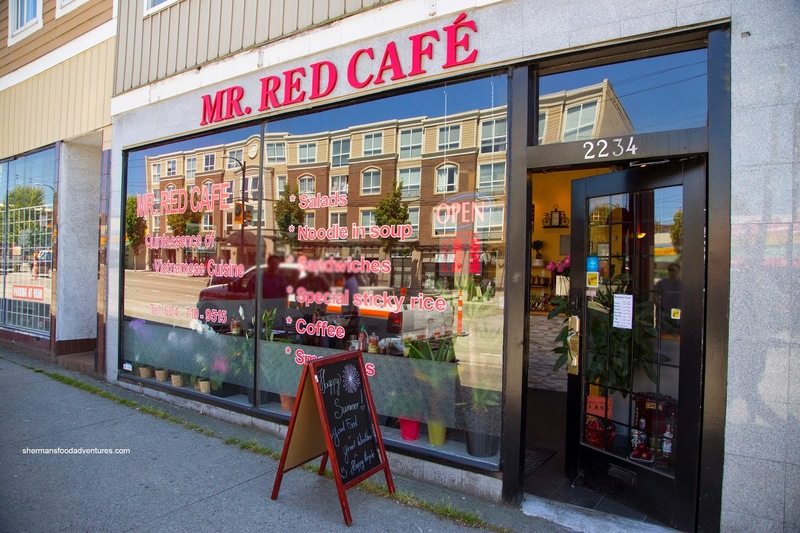 Steve, who helps run the Canadian Festival of Chili and BBQ each year in Langley, was the first person to alert me to this new little Vietnamese joint on Hastings called Mr. Red. I'm not really sure why they are named that way but my guess is either someone is called Red or that it refers to the Red River Delta in Vietnam. 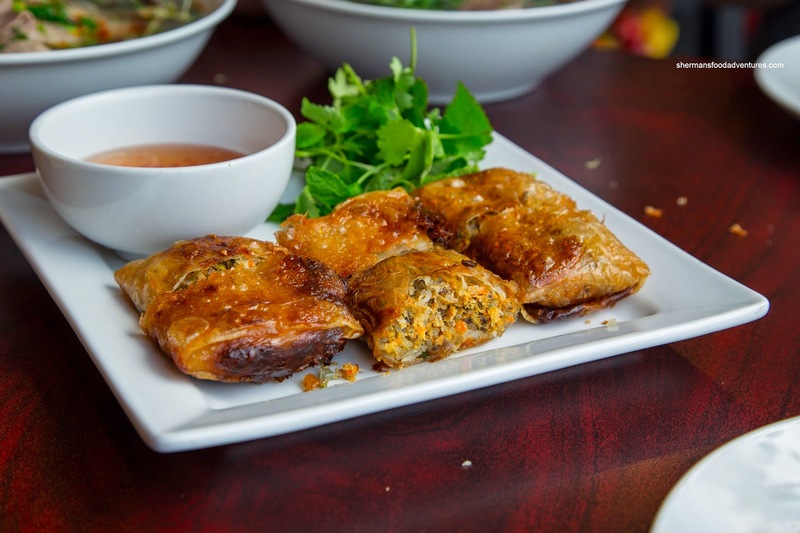 Whatever the case, you won't merely find the cookie-cutter menus you see at most other Vietnamese restaurants in town. 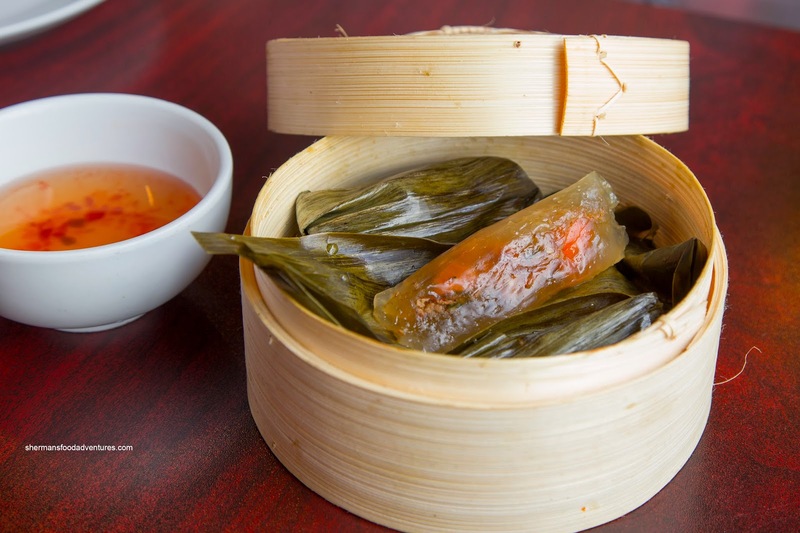 The menu has a Northern influence, much like the more extensive one at Mui Ngo Gai. However, before we could meet up there, JuJu, Kaiser Soze and Milhouse decided it was best we try the place out after Sunday hockey first. 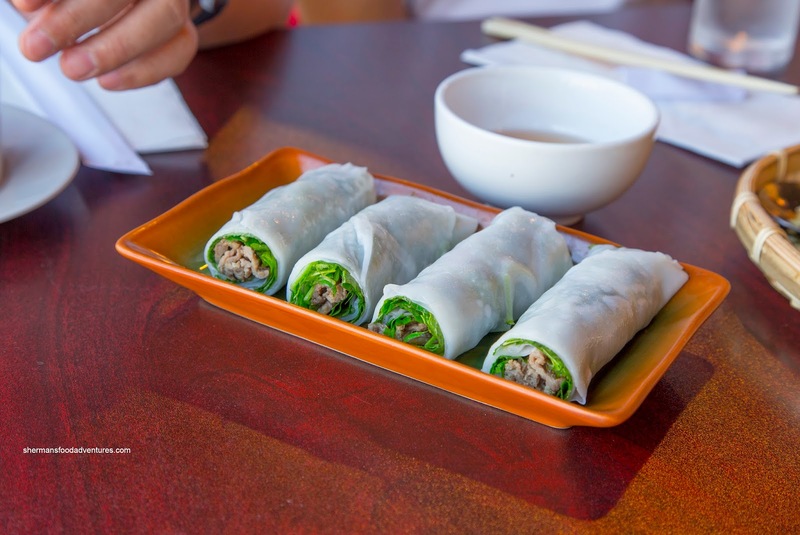 We ended up sharing a few appies including the Phở Cuốn (rice noodle roll) filled with stir-fried beef and basil. 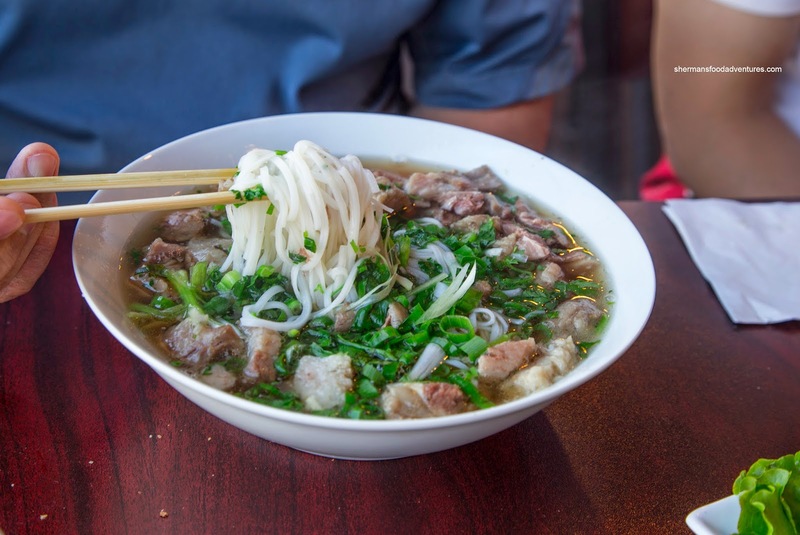 These featured soft, yet chewy rice noodle encasing beef that was meaty where it wasn't chewy. The basil really came through as it added a nice aroma and flavour. 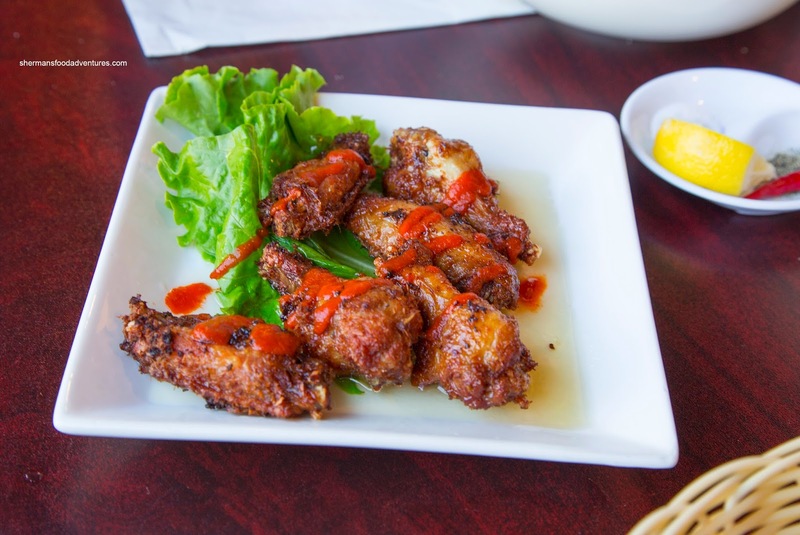 We also had the Fried Chicken Wings which were tossed in honey and topped with sriraccha. The wings weren't exactly moist, but they weren't dry either. They were sweet with a slight kick. Milhouse had the Xôi Xéo Pâté & Gà (sticky rice) and it was freakin' fantastic. 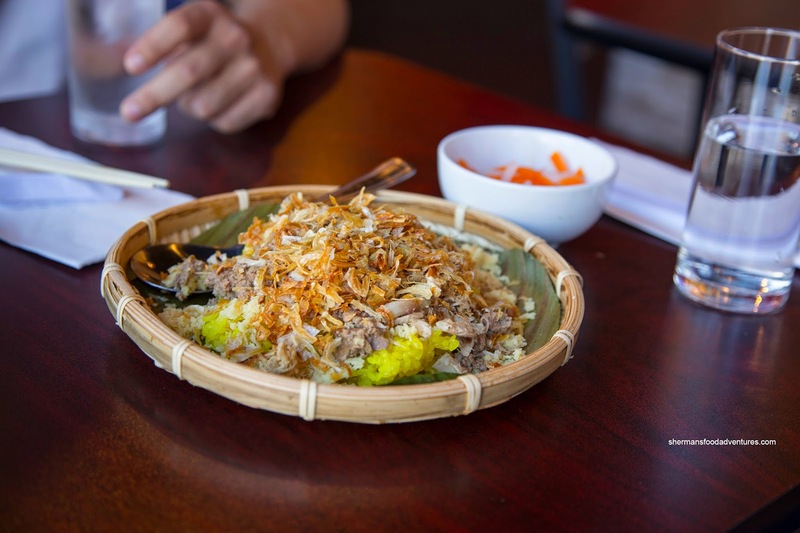 With a moist while not wet chewy texture, the rice was topped with soft mung bean, pate, chicken, dried squid and fried shallots. This was a textural and flavour delight, particularly topped with the pickled daikon and carrot (as well as a splash of the pickling juice from the peppers and garlic at the table). 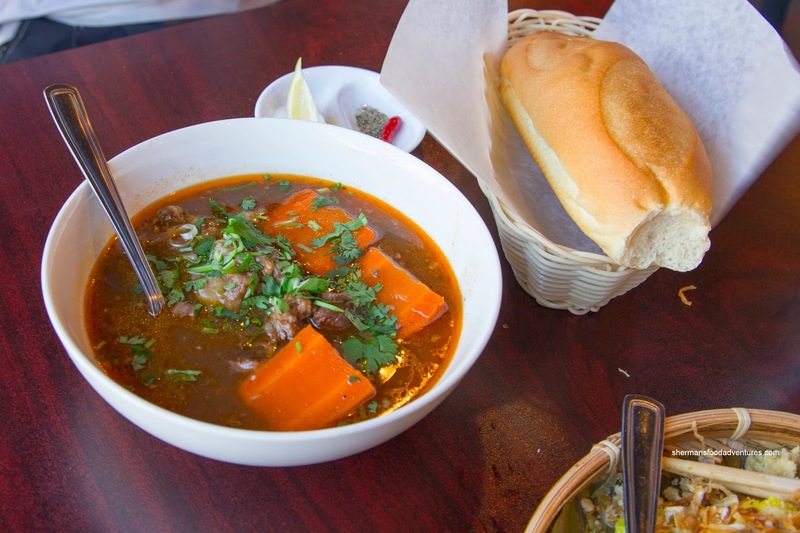 Kaiser Soze had the Bánh Mì Bò Kho (beef stew with baguette) which featured large pieces of shank. It was tender where it was not too soft either. The stewing liquid had depth and was plenty flavourful with just a hint of spice and the essence of star anise. The crusty bread was perfect for dipping. 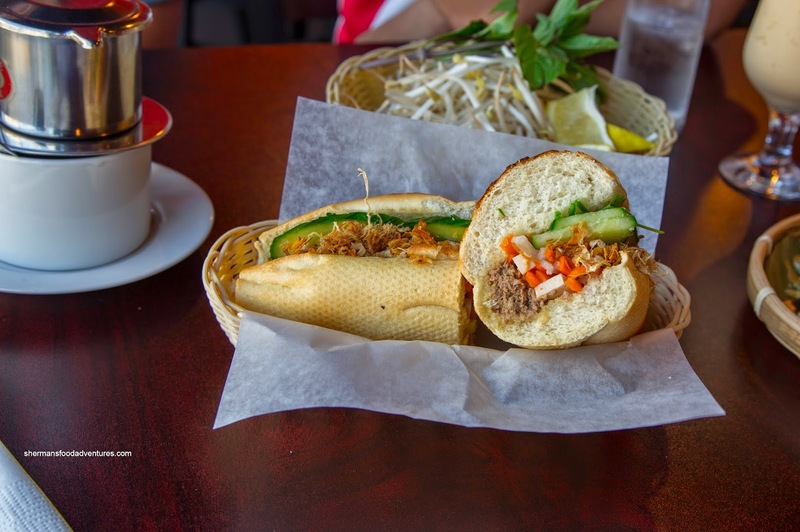 JuJu and I decided to share the Bánh Mì Pâté and it was a great decision. Loaded with impactful pate (the most I've seen in a banh mi) and drops of Maggi, this was a flavourful sandwich. The bread itself was on point too being light and crusty. There was enough of the other ingredients such as the pickled veggies and cucumber to add some brightness. For my main, I tried the Bún Gà Dặc Biệt (special combination of vermicelli, chicken, pork balls and dried mushroom in soup). I found the broth to be well-seasoned without being salty. The noodles were a touch soft while the amount of chicken was not really enough. The meatballs were nice though being meaty. For me, there was far too much cilantro and onions. JuJu had the Stewing Beef Noodle Soup and much like my bowl, it was plenty flavourful. However, the chunks of beef were disturbingly fatty with very little meat. He ended up leaving most of it in the bowl as he couldn't eat it. On other visit, I met up with Sean and Steve (finally). We ordered everything to share including a bunch of appies. We got the Bánh Bột Lọc Lá Chuối (tapioca dumplings wrapped in banana leaves) first and they were definitely bouncy and a bit chewy. I liked the filling as there was larger chunks of meat that tasted appealingly good with a balance of sweetness and savoury. 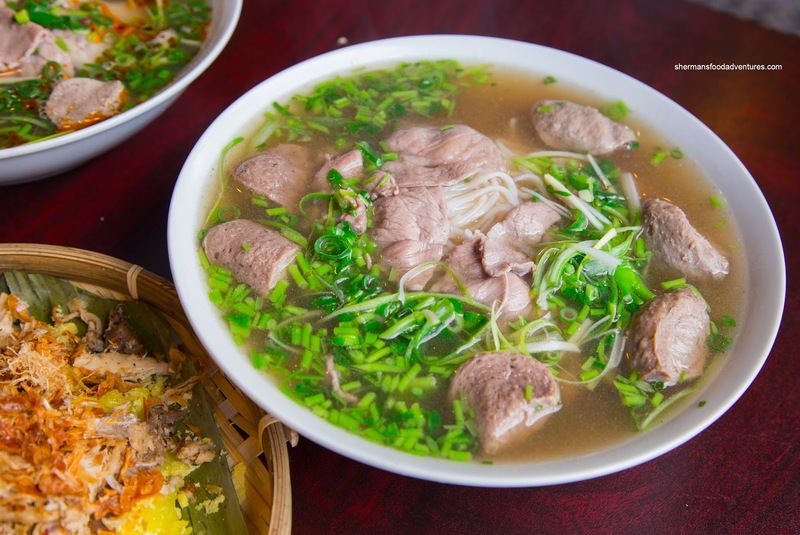 In addition to some repeated dishes from last time, we also tried the Bún Bò Huế and Phở Bò Viên. 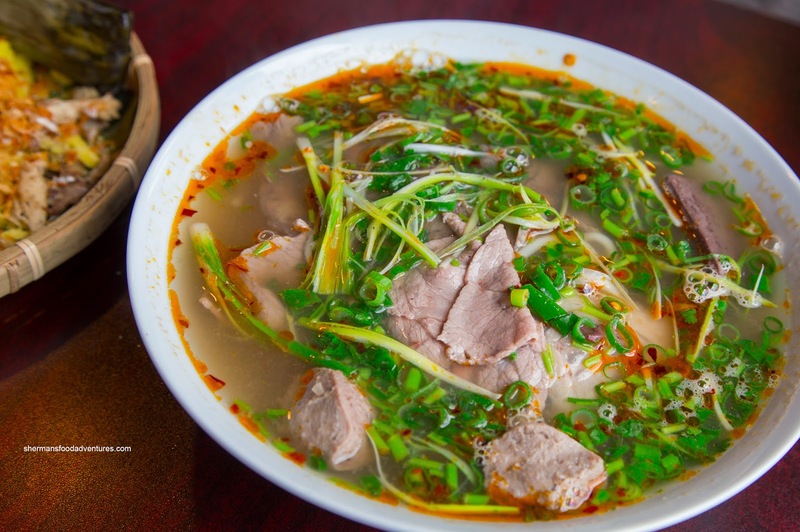 Although the bun bo hue didn't look at that flavourful, one sip of the broth and that was not the case. There was a good spice level with a hint of aromatics. I would've liked to see more lemongrass though. The meats were sliced thin and tender while the chunks of pork blood as well as pork knuckle (albeit removed from the bone) was a nice surprise. 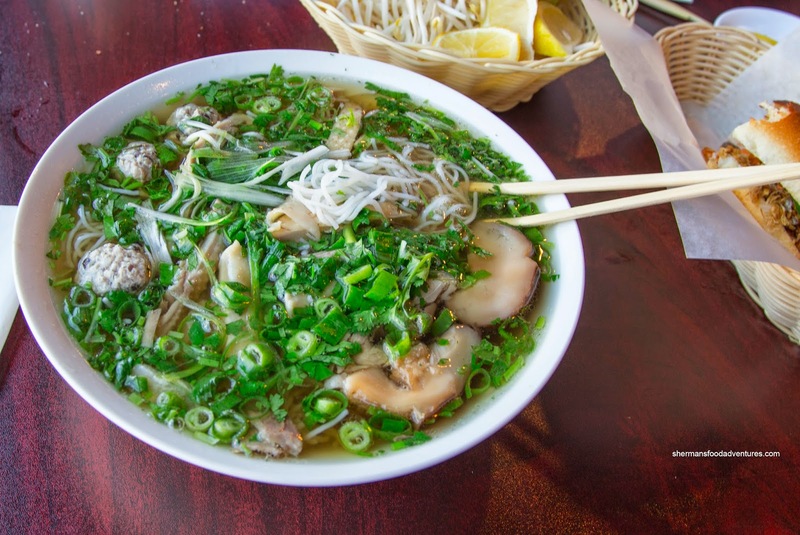 As for the Pho, I found the broth to be clean and straightforward. That meant the flavours were not out-of-balance, rather I got the meatiness as well as the usual ingredients such as onion, sugar and a touch of anise. Lastly, we had the Crab Spring Rolls which were super crunchy with a thin layer of rice paper wrapper. It was obviously freshly made since the texture was on point as well as taking some time to show up at our table. Inside, the filling was on the softer side but did have a nice sweetness accented by fish sauce. This was a nice finish to 2 really impressive visits to Mr. Red. I strongly urge people to try the place out because the food is carefully prepared and a bit different than the usual. Spoke with Rose (the owner) about the fried donuts. It turns out they are no longer offering it free with the soup (yes, I agree they should blacken it out on the menu). They are now offering a larger version as a side dish for $2. I tried it last night, it is more like a fry bread than a donut, and while it is not too exciting on its own, it is excellent for dipping in your sauce or soup, which is what it is intended for. IMO, it is well worth the $2, I'll be ordering it again. @Steve Cool, I need to go back and try it. Yah, it more resembles a Chinese Yau Tiew than an actualy donut. Love them with congee!